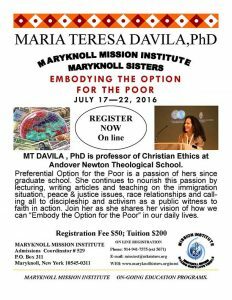 The Maryknoll Mission Institute is hosting the program, “Embodying the Option for the Poor,” from July 17-22, 2016. The program will be presented by Maria Teresa Davila, PhD, a professor of Christian Ethics at Andover Newton Theological School. The registration fee is $50 and tuition is $200.